Last year’s point guard and co-captain, David Merritt, answers a few questions about the season thus far. Make sure to follow him on Twitter (@DavidMerritt15) as well as his company website, IMU The Inside Out. His recent blog post about the fall out from Ekpe Udoh’s transfer is also definitely worth a read. Since the last interview, Michigan has lost twice in a pair of disappointing performances against Boston College and Utah. The offense has struggled but, to me, the defense has been the biggest problem. Any thoughts on what’s wrong with Michigan’s defense at this point? That’s really the most fascinating aspect of this season. Our shooting has relatively been so poor that our defensive weaknesses are so much more glaring. Through these nine games, if Michigan just hits ten more threes total, we probably only have two losses and everything is a lot different. However, I agree with you. I think it comes down to focus. It’s really the mentality that needs to improve. In my last Q & A, I talked about the difficulty in learning defensive concepts, especially with young players. As a result, you understand someone not making a rotation from time to time because they are preoccupied with their own man. However, there isn’t much room for error when it comes down to effort and focus. Our defense has mental lapses, simple as that. Guys are missing shots on offense or turning the ball over and letting that effect their focus on the defensive end. However, you see that this team has the ability to play defense with all the turnovers they have been causing. Just can’t play defense on selected possessions though. One of the common mantras is that this team goes as DeShawn Sims goes. At times he looks like the best player on the floor and at other times he is almost invisible. Cause versus correlation arguments aside, the numbers are a bit scary: DeShawn is averaging 20 points and 10 rebounds in wins and 10 points and 5 rebounds in losses. How important is Peedi’s performance to this team and how can he be more consistent? That’s an interesting mantra but it has some validity. For a team that’s struggling offensively, your big time players have got to be there every night. You know what Manny is going to give you, that’s a given. Turns out, DeShawn has the ability to play at that same caliber. For a team that’s already searching dearly for a consistent 3rd scorer, option 2 needs to be there. So in essence, DeShawn is extremely important to this team because everyone can really feed off his energy when he goes at it full force. If you go back and look at ALL of our big time wins last year, you’re going to find DeShawn Sims’ name written all over them. DeShawn can be more consistent by continuing to improve his focus and dominating from 15 feet in. I loved how he played vs U of D because he didn’t just settle for 3s. He found his rhythm by making moves off the dribble and attacking before he went outside. Michigan needs him inside and they need him to be a monster on the glass. 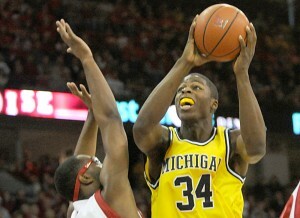 When DeShawn plays like a monster, Michigan usually wins. Looking ahead to the Kansas game. They are the number one team in the country and dominant on both sides of the ball, probably the best team Michigan will face this year. As a player, what are you thinking about a game like this? This is the first game Michigan in which Michigan has been the underdog all year, could this help them break out of their slump, relax and play a little looser? I think so. What do you have to lose? If you leave Kansas with an L, you met expectations. So all you have to do is play 40 minutes of basketball and shock the world. There is absolutely no pressure, you can just go out there and give it your all. It doesn’t get any better than this. Playing on the road period is one of the best experiences in college basketball. Throw in a number one team in Kansas and you have got heaven on earth. And the beauty of this game is if you’re able to play well, it can really get your confidence going and give this team some momentum going into big ten season. 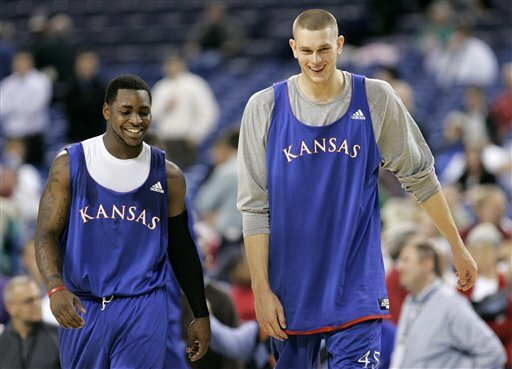 Sticking with Kansas… Have you seen them play this year? They are a team with very few flaws but if you were coaching Michigan what tweaks to the game plan would you consider? What were your thoughts on the UofD game? It seemed that Michigan might have finally made strides on the defensive end but they have yet to put together a complete game. Did you see Sunday’s game as a positive or did it raise more questions? You have to be encouraged by the second half defensively and the spark you got from DeShawn. You want to take that same momentum and try to turn that type of effort into a full game. Only way you do that is by giving tremendous focus and effort on every play. Let’s see how it goes against Kansas.